My obsession with super-sized cuddly fruits continue! Many of you have left comments saying you can’t crochet but would like to make one of my Amigurumi Pears. So I’ve come up with a knitted version just for you. Perry the pear is huggable, cute and has a big heart. I have him sitting around the house – on the bed, on the sofa but most of the time he’s right here on my desk. Whenever I get frustrated and need to turn my frown upside-down, Perry is there to greet me with his loving smile. A cuddle a day sure brightens my day! I knitted the pear with soft bulky weight acrylic yarn, which makes Perry a quick and affordable plush toy to make. 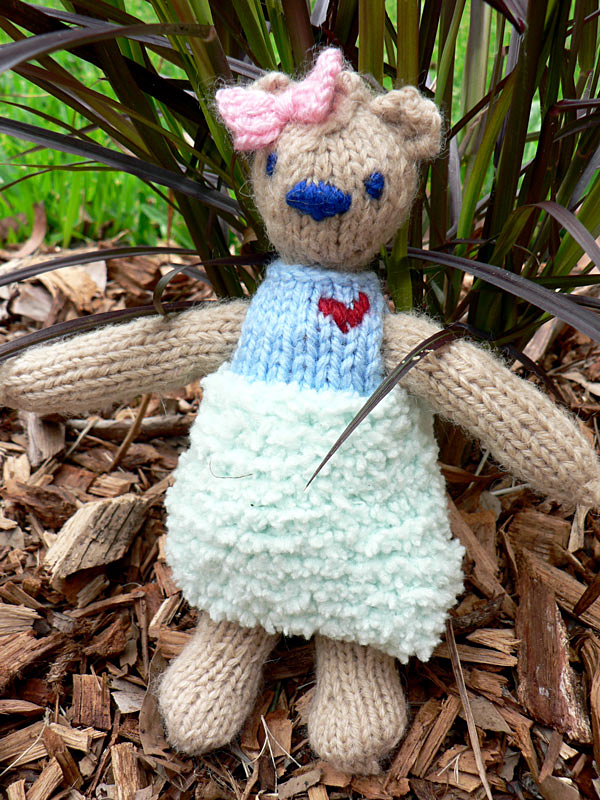 He is a fun one-skein, weekend project and your kids would love you for it. I dare say the grown-ups would love him just as much too! 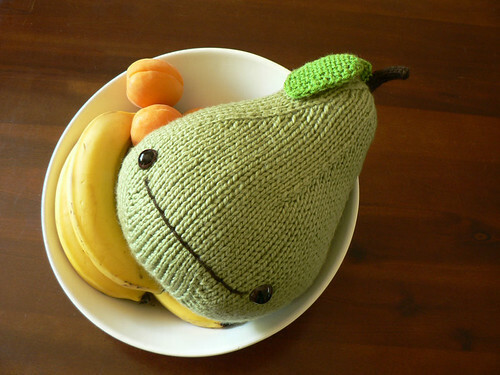 If you’d like to make your own pear plushie, please visit my Perry the Pear pattern page. 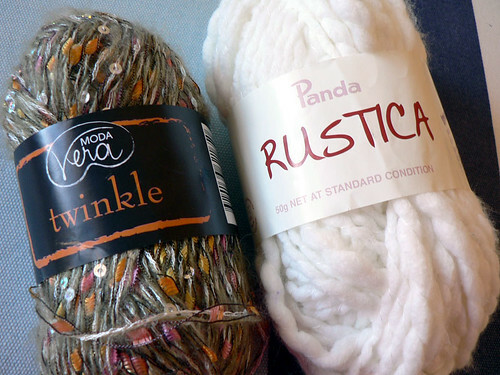 I’ve been sorting through my stash yarn and accidentally ended up with these two very different yarns sitting next to each other. A light bulb went off in my head and after a few trials and errors, I knitted up The Twinkle Purse! It’s a perfect project for the beginner knitter who wants a little challenge or for those experienced knitters to use up two skeins of their fancy yarn (often bought impulsively during yarn sales!). 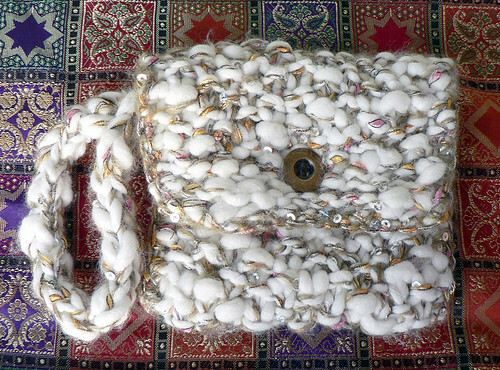 It is a very quick knit and you should be rewarded with a glittery purse in one afternoon. I’ve made the pattern with the beginner knitter in mind, thus it has more pics than a normal pattern. It’s still only two pages long though. Please email me (salihan@gmail.com) if you have made one for yourself. 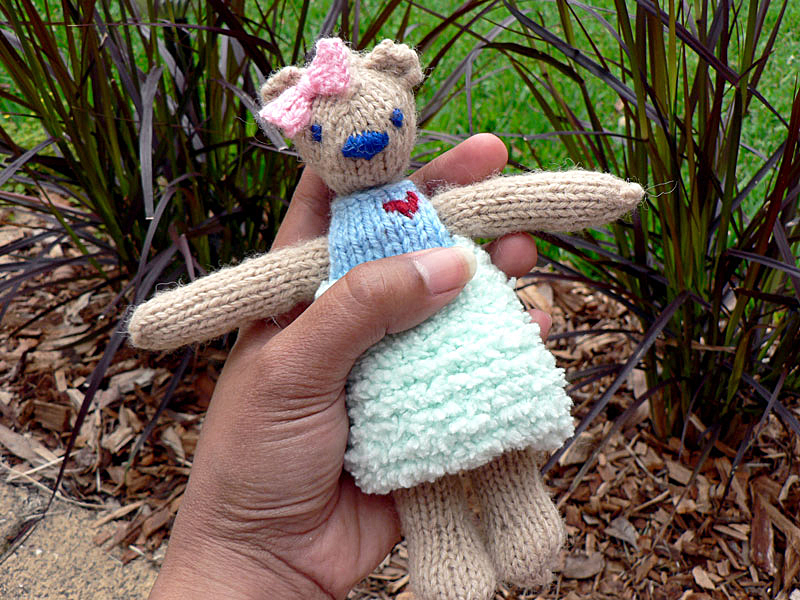 I knitted Miss Bubby for my cousin’s baby daughter, Sofea. I couldn’t resist adding a special dress and a pretty bow to the original pattern. I think she looks very puurrtyyy. With Fairy Floss yarn, cast on 17 sts. Bind off. Make another one. Sew side seams of the Fairy Floss portion of the dress. Then sew the tips of the blue portion of the dress together (at the shoulders). Embroider heart shape on the front of the dress using red yarn and straight sts. With pink yarn, cast on 5 sts. Bind off. 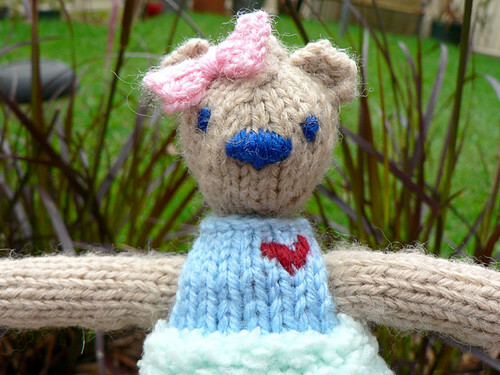 Sew on to doll or dress using pink yarn; sew over the middle(narrower) part of the bow a few times. 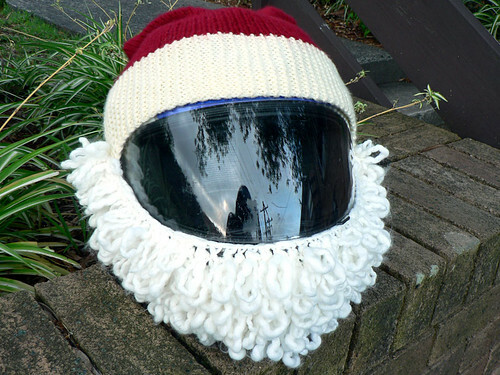 Teresa recommended the Santa Helmet to Craftzine and it got featured! It’s on several websites now, including Craftzine blog and Craft & Hobbies News. 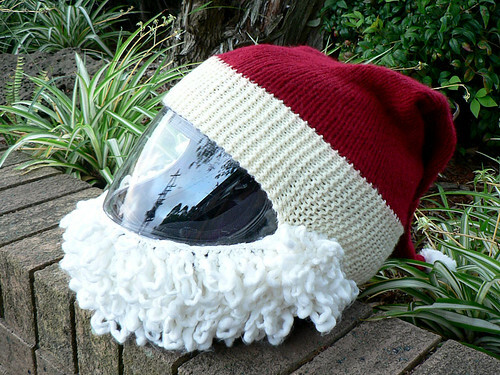 So I’ve decided to post the KNITTING PATTERN FOR SANTA HELMET here. This is my first pattern and I wrote it AFTER I made the Santa helmet thus has not been road tested (no pun intended!). It’s not a strict pattern, but rather a guideline. So if there are parts that are not clear, please leave a comment so I can fix it. Thanks! CO 14st with 2 white yarns held together. You might need more or less stitches depending on how tall you want the brim. Knit with 2 yarns in garter stitch until the desired length ie stretch it around the helmet where the white brim is meant to sit and knit till it fits very, very tightly around the circumference. Cast off. Using 2 red yarns held together, pick up stitches along the length of your white long rectangle. I picked up one stitch per row. Knit in stocking stitch till the work measures about 15cm. Start decrease by K2G at the start and end of row (RS). Repeat decrease every 4th row until you’re left with 22 sts. From now on, decrease every row on RS till you’re left with 10sts. Leave a very long tail and cut yarn. Using a tapestry needle, thread the long tail through every other st on needle and back through remaining stitches. Pull yarn tightly. Using the long tail, sew the edges together. I used a mattress stitch seam. Make a large white pom pom and attach to the pointy tip of hat. Hat done! Knit till desired height for your helmet – measure just below the visor till the bottom edge of helmet. Cast off. Put the hat onto the helmet and wrap the beard around the front. Sew one end with white yarn onto the Santa hat. Stretch the beard tightly over and sew on the other end. Beard done! Using non-slip rubber backing that you use under rugs, cut a 5cm strip according to the circumference of your helmet. Seam up end with regular thread or use sewing machine. Now you’ve got a non-slip “belt”. Sew using regular sewing thread to the underside of the white brim on 8 equally spaced out points. Make sure you stretch the hat as you figure out where you need to sew the strip to. Cut a 15 x 7cm rectangle from the non-slip rubber backing and sew on to the underside of the beard. I sew mine on in the middle top part of the beard ie just under the bottom edge of visor. Put the Santa hat on to helmet. Fold the pointy red tip to the back of the helmet till it touches the hat and sew in place. This prevents the tip from flying around while you’re riding.